An abandoned hair salon in Namie. A radiation-monitoring device stands in front of Ukedo Elementary School in Namie. A sign that reads “Do not enter” hangs along Route 6 in Tomioka near the Fukushima Daiichi Nuclear Power Plant. An abandoned bicycle shop in Namie, a town too close to the ill-fated Fukushima Daiichi Nuclear Power Plant. Weeds grow in the parking lot of an abandoned restaurant along Route 6, just outside the exclusion zone around the Fukushima Daiichi Nuclear Power Plant, which suffered a multiple-reactor meltdown following a 2011 earthquake and tsunami. Noboru Honda, a local community leader, stands near the monument inscribed with the names of the victims of the 2011 earthquake and tsunami in Namie. NAMIE, Japan - Noboru Honda lost 12 members of his extended family when a tsunami struck the Fukushima prefecture in northern Japan nearly eight years ago. Last year, he was diagnosed with cancer and initially given a few months to live. That's all gone. On the main street, a small new shopping arcade has opened. But a short walk away, a barber shop stands abandoned, its empty chairs gathering years of dust. A sign telling customers to make themselves at home is still displayed in a bar, but inside debris litters the floor. A karaoke parlor is boarded up. Wild boars, monkeys and palm civets still roam the streets, residents say. Just 873 people, or under 5 percent, of an original population of 17,613 have returned. Many are scared - with some obvious justification - that their homes and surroundings are still unsafe. Most of the returnees are elderly. Only six children are enrolled at the gleaming new elementary school. This is not a place for young families. Greenpeace has been taking thousands of radiation readings for years in the towns around the Fukushima nuclear plant. It says radiation levels in parts of Namie where evacuation orders have been lifted will remain well above international maximum safety recommendations for many decades, raising the risks of leukemia and other cancers to "unjustifiable levels," especially for children. 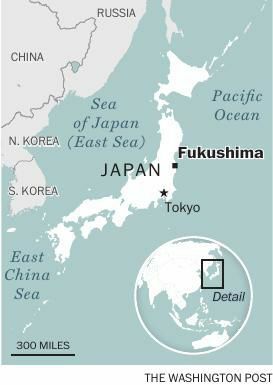 "The scale of the problem is clearly not something the government wants to communicate to the Japanese people, and that's driving the whole issue of the return of evacuees," said Shaun Burnie, senior nuclear specialist with Greenpeace. "The idea that an industrial accident closes off an area of Japan, with its limited habitable land, for generations and longer - that would just remind the public why they are right to be opposed to nuclear power." "As a community, we were already suffering from an aging population," said Katsunobu Sakurai, former mayor of the nearby town of Minamisoma. "Now, the damage is more severe because young people are not returning. The elderly who come back feel pessimism and depression. The biggest tragedy now is the high rate of suicides." "For the past eight years, we have seen the destruction of the area, the destruction of the community, and it will be difficult to bring people back," he said. "But throughout history, we have been through many hardships. If we give up, we would lose our town, and as mayor, I will work with all my heart to prevent that." The government is building and fortifying sea walls along hundreds of miles of the Pacific coast to prevent another tsunami from wreaking havoc, but some residents say they weren't consulted and aren't happy about being shut off from the sea. The Washington Post's Akiko Kashiwagi contributed to this report.